Party Express offers the least expensive bulk Red, White and Blue party supplies, decorations, and favors on the market. Celebrate America with the huge selections of Americana Hats, Party Beads, USA Banners, Patriotic Costume Accessories, Decorations and more. Make Uncle Sam proud this Independence Day by throwing an 4th of July party of the millennium! The good news is that Party Express has the wholesale party favors and decorations to do just that! Start by selecting some inexpensive red, white and blue costume accessories for your guests to wear. Be sure to check out our full selection of patriotic costumes and accessories. This section has everything you need for getting in the patriotic spirit! You will find wholesale hats, beads, wristbands, and even novelty eyeglasses. Party Express has it all! 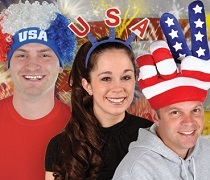 These accessories are perfect for you or any guest to wear to your 4th of July special event at your establishment. Make sure that you do not forget the 4th of July decorations. 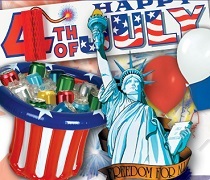 You will find all sorts of discount 4th of July party decorations! First, grab some patriotic table covers and toss some confetti on your tables! This is just the start of setting the scene for your red, white and blue event. Then grab some wholesale star centerpieces, plates and napkins. Now you are cooking! Once that is complete start hanging some of our discounted whirls and banners on your ceiling. Now you have almost everything that you need to have an amazing 4th of July party. Browse through our full selection of red, white, and blue decorations and get everything you need to have a one of a kind Fourth of July Party.